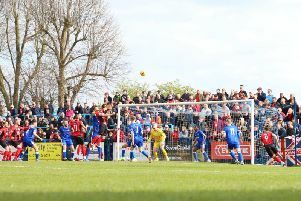 Marcus Law insists Kettering Town must win their next two matches if they are to make it into the Evo-Stik Southern League Premier Division play-offs. The Poppies were forced to settle for a 1-1 draw with fellow top-five contenders Leamington in a frantic encounter at Latimer Park on Tuesday night. With Hungerford Town snatching a last-gasp 1-0 win at King’s Lynn Town, Kettering dropped out of the play-off places but could leapfrog both Leamington and Hungerford into fourth place if they beat Bedworth United at Latimer Park tonight (Thursday). With such a high volume of home games recently, the Poppies have made tonight’s clash a ‘pay what you want’ fixture for fans with the minimum admission fee being £1. Bedworth sit rock-bottom and have already been relegated, as have Saturday’s visitors Bideford. And, with back-to-back away matches at Redditch United and Dorchester Town to follow in the final two games of the regular season next week, Law knows there can be no slip-ups from his team in the next couple of days. The Poppies boss said: “Let’s be straight. If we have any desire to be in the play-offs then we have got to beat teams who are getting relegated, end of. “We have to go and win these games and if we do then I think we are in with a good chance. “The saving grace is Hungerford and Leamington play each other on the last day so out of the three of us, only two of us can take maximum points. I believe that is a key factor in all this. “It’s massive game tonight but I think if we play with that intensity we have shown of late then we will put Bedworth under a lot of pressure. “It will be down to their professionalism and their will and their want to get something out of the game. Knowing Stuart Storer like I do, I am sure they will be up for it. “But we are up there and winning games for a reason. Law is set to rotate his squad again for the next two matches with Gary Mulligan set to return from a knee injury, although striker Spencer Weir-Daley is likely to miss the remainder of the regular season after dislocating his shoulder. The Poppies made five changes to their starting line-up for last weekend’s 3-0 win at Chesham United and then rotated it again for Tuesday night’s draw. “We weren’t prepared to take the risk on Gary but he will be back in to give someone a warranted rest,” Law added. “I think the changes were from Saturday to Tuesday were justified because of the intensity of the game.